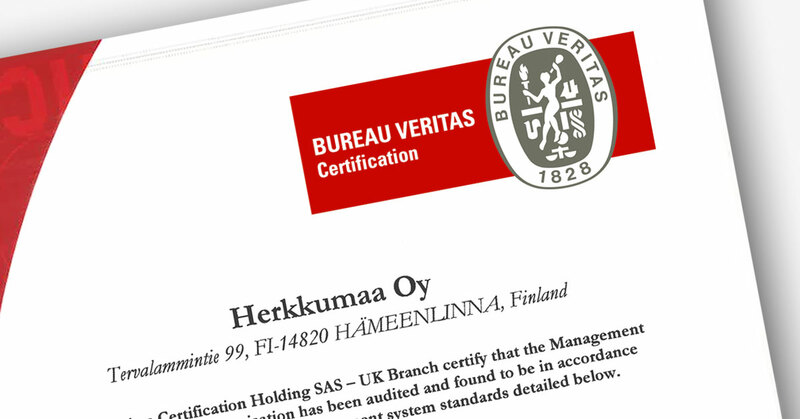 Herkkumaa’s preserves and jams have had the Bureau Veritas quality certificate for quite some time. Now the quality system has also been extended to cover the mayonnaises and condiment sauces. ‘We produced the first mayonnaises and condiment sauces at our Hämeenlinna factory last year. 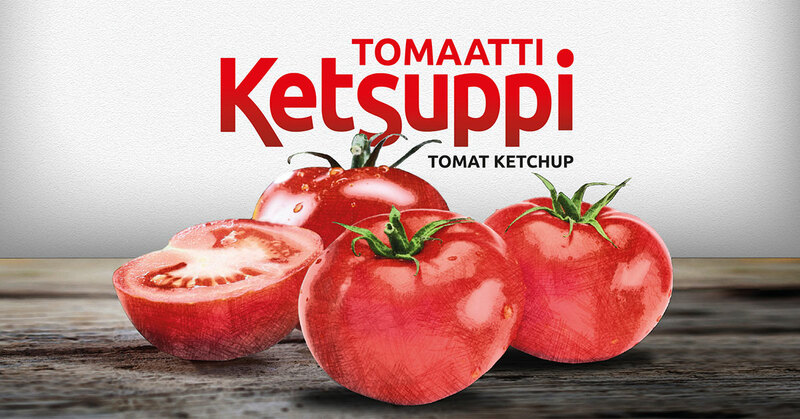 With the aid of the new production line and recipes, we are going to produce the best ketchups, salad dressings, barbecue sauces, salsas, and dips in Finland. For instance, our new preservative-free ketchup and Finnish real mayonnaise have already won over a large number of HoReCa professionals. No other Finnish manufacturer is currently offering similar products. This year, we will supply stores with several other new sauces as well’, says Atte Rekola, Managing Director at Herkkumaa. Some time ago, we started developing a high-quality Finnish ketchup. One, that could satisfy the demands of ketchup lovers, self-taught chefs, and professionals alike. One, that would combine artisan-like craftsmanship and passion to clean quality ingredients. That one is Herkkumaa’s new premium ketchup from Finland. The ketchup made with a long experience from industrial-scale production has benefited from the aid of HoReCa-professionals. As a cherry on the top, we dressed the sauce in a stylish packaging that will be easy to recognise in the grocery store close to you. Our new ketchup will find its way first to professional kitchens. The easy to open 10-kilogram angular container saves up to 33 % of space compared to typical round buckets. The product was developed with the help of professional kitchens, and we will continue listening to their feedback. During the winter, we will launch a test group with consumers. With the help of professionals and enthusiasts, we are about to create the best Finnish made ketchup available in supermarkets. And that’s a position we aim to keep. Herkkumaa Devil’s tex-mex products have found their way to the Finnish dinner tables. Thanks to the warm reception, the product series has grown, albeit in silence. Now, the time has come to take a family portrait. On the background, you’ll see the newcomers, the Devil’s mayonnaises: Devil’s Mayonnaise, Devil’s Chipotle Mayonnaise and Devil’s Cucumber Mayonnaise. You’ll meet them usually in Finnish restaurants without knowing: they may be the filling of your burger or dip for the fries, to name a few uses. These larger siblings have not yet got any smaller sisters, but there has been some kitchen talk that we could perhaps expect growth of the family any moment. On the left, you’ll meet the heads of the family. Devil’s Salad Hot and Devil’s Salad Mild. Mild is the well-mannered humanist from hell, who trust in the power of tender seduction. Hot has a more aggressive character and is going to shoot first, ask questions later. He won’t believe in atonement – instead, he’s going to punish your taste buds for the cardinal sins they’ve committed. Despite having some differences on characters, Hot and Mild can co-exist in peace in every fridge. With them, you may see Devil’s Red Pepper Jam – the step-sis better known for the sweet facade hiding the devil inside. Devil’s Salad Mild’s big sis also wanted to make sure to be seen – she’s there in the front, always wanting to be in the limelight. Perhaps she wanted to show the new look she just got – you may find her in some stores still wearing the older label. On the right of the portrait, there’s the green sheep of the family. Devil’s Sliced Pickles and Devil’s Jalapenos Slices complete the red-white-green food circle. The fiery cucumbers and hot jalapenos are devilishly good as a snack, on bread, salad table or in hamburgers. From the photo shoot, the family continues its road to the store shelves. 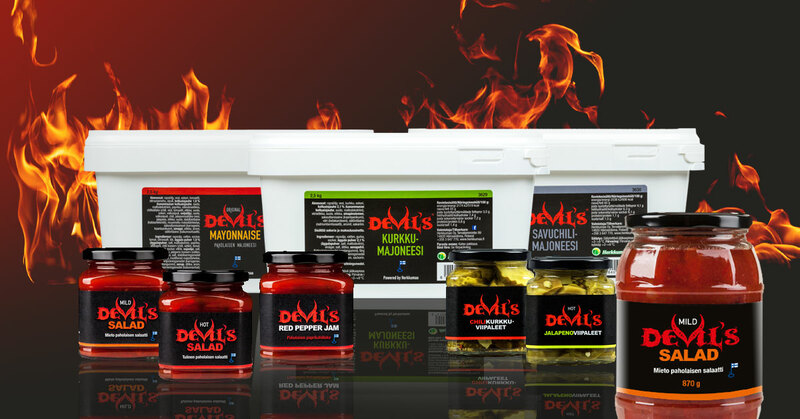 You’ll recognise the devils from the dark label, that separates them from other tex-mex products. Part of the family may have escaped to the conservatives section and the chilli cucumbers are also sold by kilogram in larger supermarkets. Find the devil. Otherwise, the devil will find you. Check out the whole Devil’s selection here. Made in Finland from the best ingredients: Herkkumaa’s new Finnish mayonnaises come in HoReCa-size packs. The large, angular packages are filled with rich, high-quality mayonnaise. 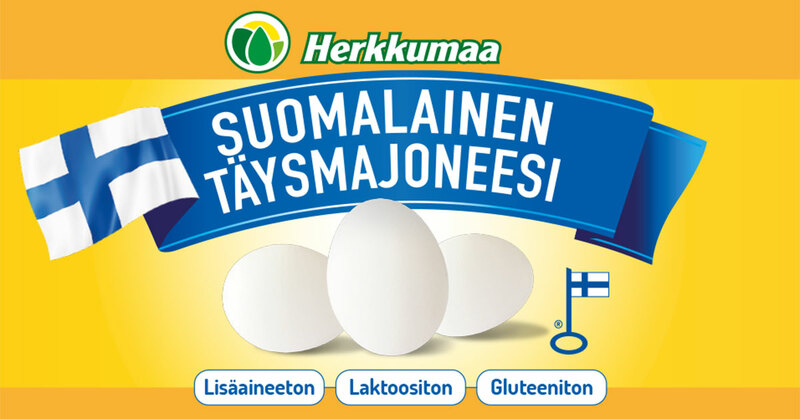 No preservatives or other additives: Herkkumaa suomalainen 80% täysmajoneesi is a real mayo made only from real, carefully selected ingredients. Lactose and gluten free mayo is safe to use in HoReCa, as the only allergens are egg and mustard seeds. The rich, full-bodied structure of the mayo suits for salads and cooking, and as a side by itself. Tasty Devil’s mayos are free of lactose and gluten, but full of taste. They suit for fast food and can be served as such in buffets. 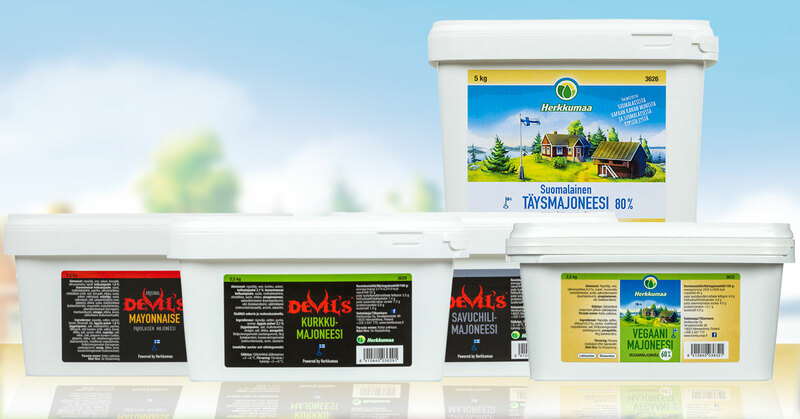 Devil’s mayonnaise is a mild chili mayo, Devil’s savuchilimajoneesi has a pleasant chipotle taste and Devil’s kurkkumajoneesi is a traditional gerkhin mayo that can be used as a dip or a filling for fast food. The mayos are made of real vegetables: the gerkhins, chilis and garlics we use are fresh, not dried powders or spices. Vegan food gains constantly more space on menus and buffets, as people are learning it can be a tasty and environmentally sound alternative to meat. Therefore, we created a vegan mayo: Herkkumaa 30 % vegaanimajoneesi. This Finnish mayo contains 30 % of fat. And we did not stop there: for the ones who want a real mayo mouth feel, there is the 60 % vegaanimajoneesi with 60 % fat content. Both are easy and tasty ingredients or additions to your vegan dishes and salads. Our mayonnaises come in 2.5-kilogram packages, except the real mayonnaise comes in a magnificent 5-kilogram box. Our packages are angular. They save up to 33 % of space in transport when compared to usual round containers. Therefore, the deliveries are more environmentally sound, as the cargo truck can be filled more efficiently. Herkkumaa is proud to present a Finnish real mayonnaise. The mayo is prepared without additives and only from real ingredients: like a home-made mayo, the Herkkumaa real mayo contains 80 % of fat. And that’s not a bad thing, as we are talking about pure food made from nature’s best ingredients. We didn’t reinvent the wheel. We just made an excellent mayonnaise. The mayo is naturally lactose and gluten free. The allergens are only egg and mustard, which is used as a spice. Restaurants around Finland have found our real mayo – you may meet it in many nationwide restaurant chains, as well as in local restaurants. At the moment, we are collecting feedback on the mayo and fine-tuning our production line, so that this great real mayo will find its way soon to the shop near you. Last spring we started packing our gerkhins with Easy Open lids. Now, we added Easy Open lids also to our jams and will continue the change so that in the end all our smaller (less than 3.1 kilograms) jars will be covered with these practical lids. 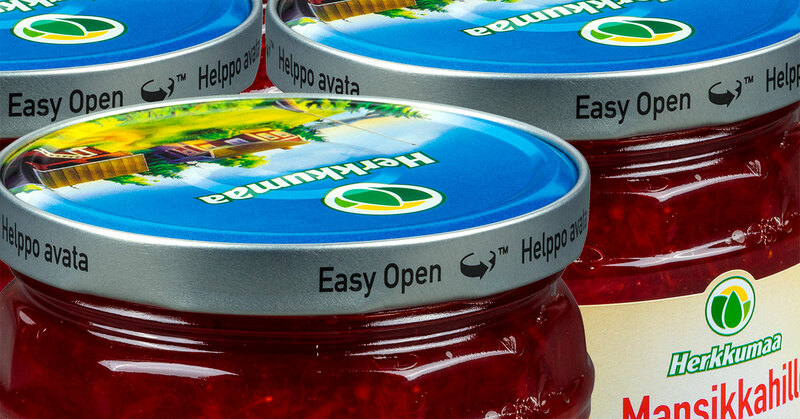 You will recognize the easy to open lids with “Easy Open” text. These covers are made from two pieces so that the vacuum can be released with light movement. The move to Easy Open lids started from customer feedback. – We aim to help people’s every day by offering easy to use, delicious conserves. Easy Open lids were in line with the target and therefore we decided to invest in the new packaging line. The investment was significant, but we believe it will boost the demand, says Herkkumaa CEO Atte Rekola. The Regional Organisation of Enterprises in Tavastia awarded Atte, Ari and Sami Rekola from Herkkumaa Oy for successful entrepreneurial activity as the entrepreneur of the year of Tavastia Proper in 2015. – The secret of our success is the taste and quality of the products as well as the security of supply. It all starts with doing the right things with the right people, Managing Director Atte Rekola says. 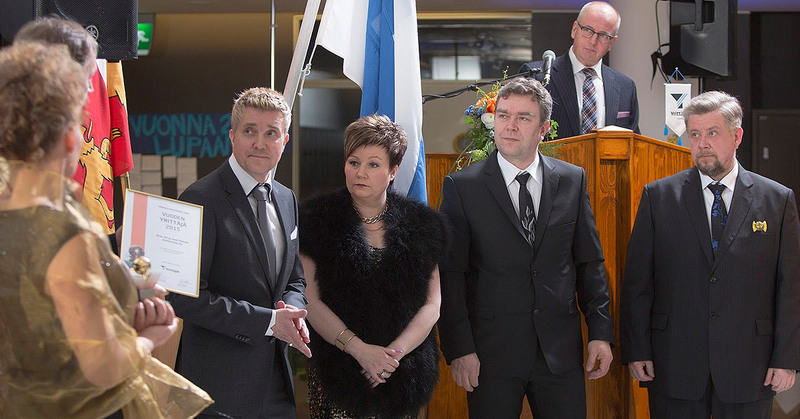 Herkkumaa looks forward to the future with confidence. A new automated production line has added a boost to production. Moreover, an expanded labour force has been hired. ”There is no more time for gloom. Finland must now start to rise again, and it happens through jumping in and getting it done”, Rekola says. 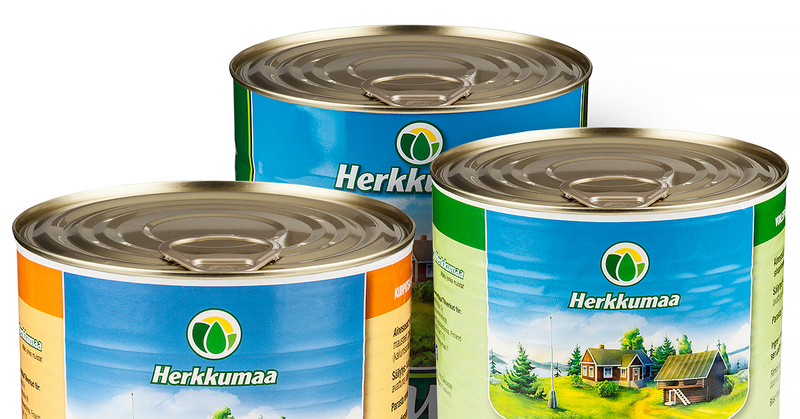 The new user-friendly easy-open lids of canned vegetable of Herkkumaa make the opening of metal cans even easier than before. The new lid can be found in all of about three-kilo metal can packaging. In the convenient cans are cucumber salads, pickled, sliced and sandwich cucumbers and whole beetroots, pumpkin salad and picked pumpkins. Herkkumaa is one of the exhibitors at the Food from Finland country section in the Anuga 2015 Fair, October 10 to October 14, 2015, organized in Cologne. The official country section of Finland, with its 100 square meters, is implemented impressively on a high standard and in the Finnish spirit. Herkkumaa welcomes everyone to the section number 10. The Anuga Trade Fair is organized every two years and brings together decision makers in food from all over the world. To the internationally prestigious event are expected 150,000 visitors from different countries. There will definitely be a lot to report on about the world’s biggest food event after the fair. The renewed juices of Herkkumaa arrived at the shelves of the stores appropriately just for the summer. 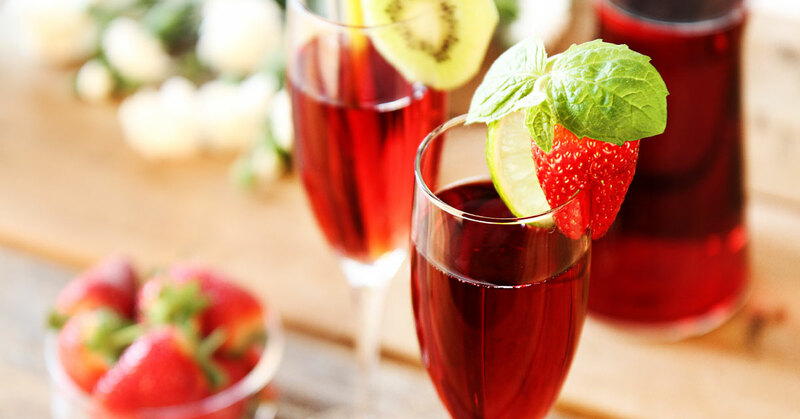 Summery strawberry and raspberry juices are subtly sweet and perfect for the adult taste. The homey flavour of blackcurrant juice is reminiscent of leisurely summer days at the summer cottage and at Grandma’s place. The color of pear juice is now yellow gold. Diluted in ice-cold water, the juices of Herkkumaa cool you on hot summer days, at the picnic, at the barbecue and at the family party. Juices and drinks >>. The cucumber salad of Herkkumaa is conquering the world!